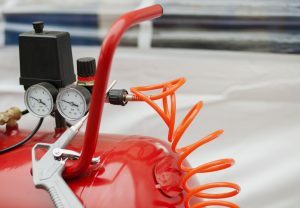 You’ve invested a lot of money into your air compressor, so you want it to last as long as possible. Here are three easy things you can do to keep your air compressor running efficiently. The hoses of your system may begin to crack or corrode as a result of wear and tear. When that happens, air will begin to leak, which will cost you extra money in energy costs. You should inspect your hoses regularly and replace any that seem worn as promptly as possible to prevent any loss in productivity. Over time, the air tank will accumulate excess water generated by your unit, especially if your facility experiences humid temperatures. Most tanks have a drain valve at the bottom where you can empty the extra water. Keeping the air compressor tank dry will help prevent corrosion and prolong the life of your system. You should check the air filters periodically to keep dirt and other debris out of your system. Each manufacturer will have a recommended filter change schedule, but depending on your environment, you may have to do it more often. Get in the habit of cleaning the filters frequently and replace them as needed. Maximize your investment by taking advantage of the Preventative Maintenance programs offered by NB Sales & Service. Our knowledgeable service technicians can handle any of your maintenance or repair needs to keep your air system in optimal condition. Contact us today at (661) 397-1950 or fill out our contact form to learn more.